Simply the greatest collection of powerful card magic ever. 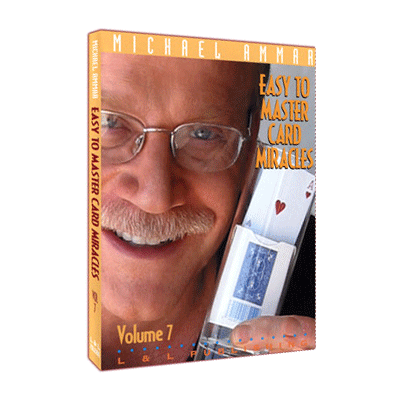 Astonishing and entertaining, this classic collection of card magic is sure to knock you out. Powerful, professional material, so clearly and completely explained that you'll want to perform every effect. Beautiful production quality, a lively audience, and multiple camera angles filming close-up and surrounded will make watching, and learning, fun! World Champion Michael Ammar, a best-selling author, award-winning lecturer, and world-class performer, handpicked each effect. These videos contain the finest magic instruction available teaching some of the greatest card effects of all time. From several angles you'll see exactly what the hands should be doing, and every effect is reviewed using Michael's exclusive Super Practice Sessions, giving you over-the-shoulder, close-up shots of the entire routine. Grab a deck of cards and get comfortable! With the secrets revealed here, soo, you will be astonishing people!